Inside IU basketball with Tom Crean was live on Monday evening from the Holiday Inn in Bloomington with player guest Thomas Bryant for the final show of the season. · The most memorable moment of the night came during Crean’s last segment, when he made it a point to have a patron named Hugh be able to ask a question. Crean: It’s our last show of the year, right? Fischer: He’s not listening right now. Crean: Hugh has got to ask a question. We can’t end the season without a question. Fischer: Well if he paid attention then he’d know you were talking to him. Fischer: He didn’t even have to ask a question here tonight at some point, so think up something decent. Crean: No, Hugh. You’ve gotta have Hugh. Fischer: Hugh, do you have a question? Crean: He obviously doesn’t because he’s not moving from his spot. Fischer: He’s moving, coach. He’s moving. Crean: He’s going to have to move a lot faster than that because we’re going to be off the air by the time he comes up here. Fischer: He’s sprinting right now. This is a sprint for him. Crean: He’s a little hard to get, isn’t he Don? He’s playing hard to get. We’re (giving) him an honorary question. Fischer: He’s got the microphone. Hugh: Coach, I’ve noticed during the season that Tom Izzo has developed a certain sneer. How about you? 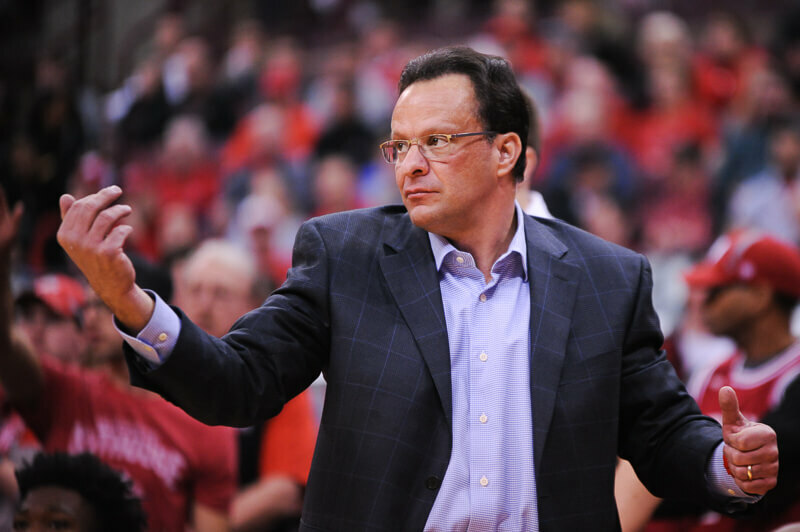 Crean: …I don’t even know how to answer that right now. Whatever I say will be used against me now and down the road. This is what I’ve done with most of Hugh’s questions that went right over my head. I’ll sneer at that one and not answer it. “Disappointment is inevitable, but discouragement is a choice.” – I like that quote and may use it going forward. I decided to do a little bit of research into the W/L record and point differentials this year and came up with what (at least in my head) seemed like a pretty incredible stat: Purdue won the B1G outright with a record of 14-4; IU was therefore 7 games removed from 1st place. If you look at the games that IU lost, the 7 closest conference games were lost by scores of 1, 3, 4, 5, 5, 6, and 7 points. Assuming my math is right, just 31 points were the total difference between 1st place in the conference and 10th for the season. 3) When in the half court sets..IU is not very good (with the exception of Green) in making the post entry pass in the right place for a scoring/foul opportunity. 4) When you are throwing away nearly 25% of of your offensive possessions with dumb TO’s..that’s 25% of the time you have no CHANCE to be fouled. 5) I think post and under the basket officiating this year has sucked….seems like the rules change every day. Until TB and DD learn how to handle the double teaming as well as Happ does….our post scoring/foul opportunities will continue to wain. I’d add that TB is not very polished when he gets the ball in the post. If he can’t blow by his man with speed it doesn’t end up being very pretty. Sounds like Hugh agrees that CTC should be more aggressive towards the officials. That’s pretty incredible. So you’re saying we are having the opposite season of Maryland a couple years ago? I have been waiting weeks for this article. Not sure if CTC cancels the show or ITH just doesn’t report on it, but it seems there hasn’t been one of these for 3 weeks. As much as I am disappointed in the coaching this year, I still enjoy listening to coach and the players speak. I will always be a student of the game and regardless of our record, I still like our coach and the players. Remember the old commericial…”when EF Hutton talks, we listen”. That’s how I feel about coach and players. You could also go the opposite direction with losses. We haven’t exactly blown anyone out. In our 7 wins, we get a buzzer beater and OT against PS. Win by 4 against OS. One against NW. The only team we actually beat handily was Ill and lost handily to Mich twice, Peeyoo, and NW. I think 7-11 is a pretty fair assessment of our season. After watching Peeyoo beat NW, I counted the number of times Swanigan elbowed, pushed in the back, arm barred, or hip checked someone. On 3 consecutive plays beginning the 2nd half while setting screens he’d shove the guy he was screening in the back. I lost count cuz it was well over 10. Between he and showalter, I’ve never seen so much body contact that isn’t called. We’ll see how they call it in the tourney. Don’t believe me watch Peeyoos next game and focus on Swanigan. He plays like a thug. I hope he goes pro and gets his just desserts cuz NBA guys are every bit as thick as him and will hand him his lunch. As for TB he doesn’t have the thug mindset. No one has taught him what he can and can’t get away with. Crean himself has said numerous times he doesn’t know what’s a foul anymore. When your coach doesn’t know, the players probably won’t either. It’s funny after the game Painter was asked about Swanigans behavior on the court throwing temper tantrums at his teammates. He laughed and said..”but it’s a GOOD anger”. Never seen any IU players get that animated at teammates…it’s all kumbaya. Rumor was that Yogi and Troy got into a couple of very aggressive beefs off court last year. Maybe that’s the secret to winning. Last two weeks the show were pre-taped, and I don’t believe Crean even spoke for at least one of those weeks. As long as the show is taped live, expect a member of ITH to be reporting on it. Also, thanks for your continued viewership. Day late and a dollar short for that. Officials don’t respect him cuz he’s always asking questions. Was that a foul? OK. Why wasn’t that a foul? Ok. That to me is the number one reason I want him gone. When I saw the #s ITH posted about foul discrepancies, it blew my mind. I thought our offensive style is supposed to generate fouls? And before someone tells me the evils of getting a T. Most coaches can plead their case aggressively without getting T ed. Thanks for your reply. I appreciate it. I never miss any of ITH’s articles. You guys and ladies do great work. Agreed. I don’t think he needs to go so far as to get a T either, but he could certainly be a lot more aggressive and firm. I agree with most of your bullet points. Where I differ would be seeing TB in the perimeter. I like seeing him there, but only when DD is anchoring the post and JM on baseline. TB does have a reasonable 3 point shot and he drags a big out where they tend not to be as comfortable and away from defensive rebounding. When DD not in game, he was underutilized in the post. Guards need to feed the post more to play inside out. More inside out play and ball reversal would improve scoring. It’s interesting to me that CTC cites defense as one of the main reasons we won the OSU game without mentioning our better TO margin. IMO, taking care of the ball far exceeded our defense as to being the reason why we won. Our defense STILL gave up 1.24 points per possession. Normally, and especially this year, this would spell doom for us. Perhaps he’s only referring to defense in the first half and our gut check comeback in the 2nd half. Other than that I would say that with the other team scoring 92 points, highlighting defense seems kind of odd. Maybe just try and have the last word sometimes. I agree with you. I don’t think our defensive dna has changed, or will change a lot, under TC. But what we can and need to control more is TOs. Not looked at the stats, but I’d bet the differential on pts off TOs more than accounts for the loss margin on quite a proportion of games this year. Maryland does that every season. They never blow anyone out. Just goes to show how razor-thin the margin is between success and failure in the B1G. Regardless of how bad the league is in general, these coaches play oneanother often enough to know what the others are going to do. You can’t take any win for granted. Where can I find a recording of this? I missed this one. I just chose the 7 closest games. We lost 11 total, and yes, those remaining four were progressively worse all the way up to the 30 point shellacking at Michigan. If only Crean would let Thomas play in the paint and be “the main guy”! TC has said in the past that with the various rule changes each season, he tries to get an idea of how and why those rule changes will be enforced. ..on any particular night. His subliminal message to the officials is “hey there’s a lot of difference night by night, crew by crew how these rules are being called. What is it tonight.” Seems reasonable to me. IU is already giving up so many pts with bad D and TO’s..why should we give up a possible 4 pts for a tech? Maybe one or two during cupcake season to at least make a point?